Preterm birth rates increased for all linguistic communities from 1989–19921 and stabilized beginning in 2002–2004. 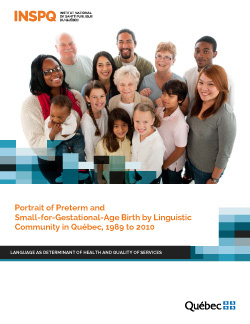 In 2008–2010 preterm birth rates per 100 live births were comparable for Francophones, Anglophones, and Allophones. Some variations were observed based on selected sociodemographic characteristics of mothers. Francophone and Allophone mothers living in highly materially deprived neighbourhoods experienced higher preterm birthrates. There were no differences in rates for Anglophone mothers based on level of neighbourhood deprivation. There was no variation in preterm birth rates between immigrant and nonimmigrant mothers for the three linguistic communities studied. Overall, small-for-gestational-age birth rates declined across all linguistic communities from 1989–1992 and have remained stable since 2005–2007. In 2008–2010 rates per 100 live births were comparable for Francophones, Anglophones, and Allophones. Some variations were observed based on selected sociodemographic characteristics of mothers. Small-for-gestational-age birth rates were higher among Francophone mothers living in highly materially deprived neighbourhoods. Rates were also higher among immigrants for all three linguistic communities studied. In 2008–2010 variations in rates for both perinatal health indicators were observed among Anglophones and Allophones based on whether the mother’s place of residence was urban or rural. Caution should be used in interpreting these results due to the low number of births in rural communities. Birth data from 1989 to 2010 (22 years) were available at the time of this study. It had to be divided into periods to generate a large enough case mix to effectively compare linguistic communities. The data were divided into three-year periods, except the initial period which was set at four years.